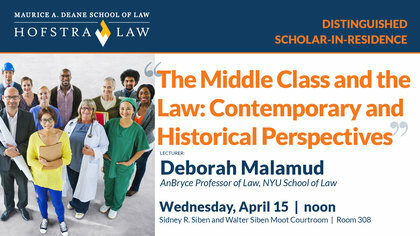 Deborah Malamud, the AnBryce Professor of Law at NYU School of Law, is a leader among legal academics who study issues of class, race, and public policy; she is also an expert on labor law and employment discrimination law. She teaches courses in the fields of labor and employment law, constitutional law, and administrative law, and has recently taught seminars on Class and the Law and Affirmative Action. Her contributions to the study of class and the law focus on how the law reflects and helps to shape our understanding of what it means to be a member of the middle class in the United States. Her work on the New Deal illuminates the interaction between class and the law through close examination of the development and public defense of labor and welfare policies that drew boundaries between different types of workers. By looking at how and why government officials decided, for example, that white-collar workers ought to receive special treatment in federal relief programs, or that certain kinds of white-collar workers ought not be paid overtime because to treat them like “clock-punchers” would offend their dignity, she demonstrates that the law played an active role in defining class boundaries and in protecting them against erosion during the Great Depression. Malamud is also known for her doctrinal and historical scholarship on key issues in labor law and employment discrimination doctrine, including affirmative action. Much of that work also involves issues of class and race. Malamud served as the faculty director of the AnBryce Scholarship Program at NYU School of Law for seven years. The program recruits and supports a diverse group of top law school candidates who come from challenged socio-economic backgrounds. She views her involvement with this unique community of scholars as both an honor and a unique opportunity. Malamud was on the faculty at the University of Michigan Law School from 1992 to 2003, where she was the James E. and Sarah A. Degan Professor of Law. Before embarking on her academic career, Malamud was a law clerk to Judge Louis Pollak, U.S. District Court for the Eastern District of Pennsylvania, and Justice Harry Blackmun of the U.S. Supreme Court. She also practice law at Bredhoff & Kaiser, a leading union-side labor law firm, located in Washington, D.C.
Malamud received her B.A. from Wesleyan University (where she majored in Religion) and her J.D. from the University of Chicago Law School, where she was the articles editor of the University of Chicago Law Review and a member of the Order of the Coif. In between, she studied social and cultural anthropology at the University of Chicago, which laid the foundation for the interdisciplinary nature of much of her scholarship. Malamud, Deborah, "The Middle Class and the Law: Contemporary and Historical Perspectives" (2015). Distinguished Scholar-In-Residence Lectures. 2.